← Does a Green Mind include Emotion? 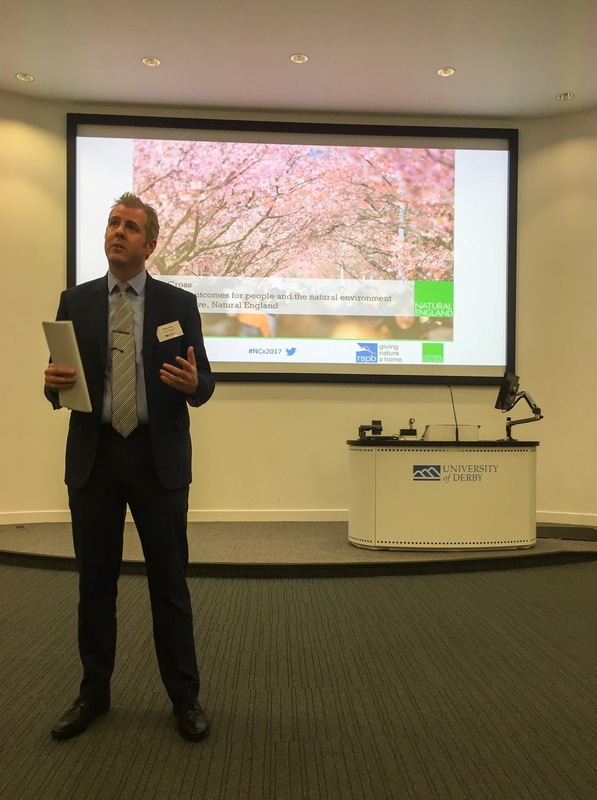 The Nature Connections 2018 conference at the University of Derby last month was the third in a series which grows as the relevance of the natural environment to everyday lives becomes increasingly accepted owing to the links to our environmental attitudes, behaviours and wellbeing. We started by reminding ourselves of the fundamentals, that nature connection is an established and measurable psychological construct and that it can be improved through affective and sensory activities (rather than cognitive and knowledge based activities). Of course, there is a need to get research evidence across, so after a burst of knowledge based talks, Mark Cocker ably returned us to the affective and sensory delights of the natural world. During the opening session, gaps in the research were also identified, the journey of connection to nature across the lifespan is not well understood. Snapshots tell us that nature connection is lower among teenagers and young adults, but there is a need for longitudinal work to gather evidence on nature connection across the lifespan – does a connected child mean a connected adult? What are the optimum times for interventions? How important is childhood nature connection? All questions to be answered. During the day there were many talks and conversations. For example, the barriers to nature were discussed, with the importance of co-designed interventions highlighted. These can be collaborations between experts and users, and across sectors, conservation and well-being for example – a health service for people and nature’s well-being perhaps? The pathways to nature connection provide a framework for such co-production activities and allows endless variety of approaches, from fashion design to bush-craft, there are pathways for everyone. This is important as personal perspectives and choice were highlighted as key to starting to get connected. We’ve become so culturally detached from nature that some people need ‘emotionally safe’ access to nature as it has become far removed from their regular lives. As emotional awareness is at the heart of nature connection, such barriers will hopefully be more easily understood. Emotion should not be shied away from. Emotions are real. They have a physiological basis and provide impetus for action and motivation, impacting the body in a manner that cognition alone cannot. It’s important to evaluate the impact of such activities, not just on nature connection as an outcome – the outcomes can be multiple and overlapping. Indeed, nature connection might not be the outcome, it may act as a mediator or moderator – there’s emerging evidence that nature connection lies at the heart of more unexpected benefits from body-image to physical activity – considered your outcome data carefully, you may have an unexpected story to tell about the benefits of nature! Applied psychologist researching our connection with nature and ways to improve it. Good for nature, good for you.